I have quite a collection of Taiwanese recipes on this blog. Seasonings such as soy sauce, rice wine, sesame oil, ginger, chili peppers, cilantro and basil are very common. My Taiwanese friend made an interesting soup dish which requires a fair amount of sesame oil and rice wine. The quantities here are readjustable, especially the soup alcohol content. 1. In a skillet, heat oil over medium-low heat and stir fry ginger until edges curved. 2. 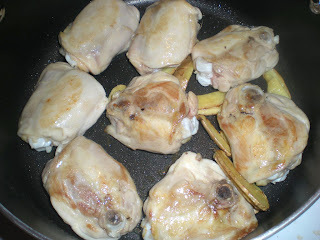 Add chicken tights and drizzle a tsp of sesame oil. Cook until meat is white on all sides. Season with salt. 3. Meanwhile, in a medium pot, combine rice wine and 1 1/2 cup of water. Heat over medium heat. Do not boil. 4. 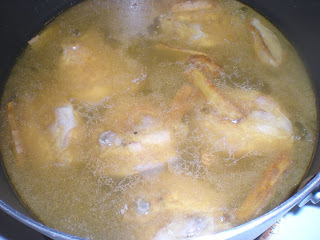 Add chicken, sesame oil and ginger into pot. 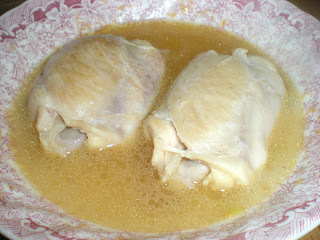 If necessary, add more water or rice wine to cover chicken. 5. Simmer for 30 mins until tender. Serve. Truly delicious...prefect soup of dinner.. This looks simple and I wouldnt add or subtract from this - chicken and ginger are probably one of the best flavor combinations out there. That soup look really comforting! Oh this looks so good. See your on a bit of a meatball kick up top. The pasta looks yummy!